Most sharks teeth are at least ten thousand years old – it takes at least this long for the tooth to fully fossilise. They are found worldwide, from a wide variety of shark species. 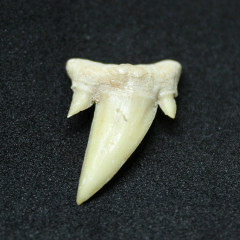 A large number come from Morocco, including the famous Otodus teeth. 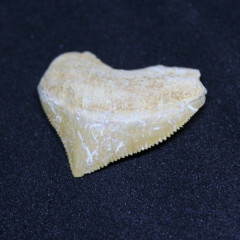 Sharks teeth are a common and very well known fossil – we all know of sharks, and this helps us relate to the fossil – having a modern day connection can make things much more easy to relate to. 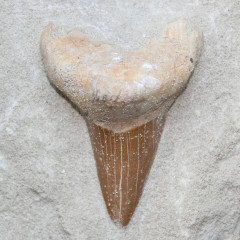 It can be somewhat difficult to identify whether a sharks tooth is actually fossilised or not – generally speaking, the paler the tooth is, the less likely it is to be fossilised. If the tooth is found miles from an ocean, it is likely the tooth is a true fossil, of course – the land was probably below sea level thousands or millions of years in the past. Along beaches and sea side areas, this is a different matter – sharks shed their teeth fairly often, and although we do not get many sharks in British oceans, they can be carried a long way as they are lightweight. Identifying the species of shark from the tooth is possible, but it can be very difficult without a lot of experience, or an idea of the age of the rocks or sediment in which the tooth was found. The most common fossilised sharks teeth are from around 66 million years ago, although some are much, much older – up to around 450 million years ago. 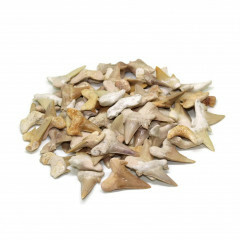 Sharks teeth are seen as a symbol of male virility, and are usually worn as necklaces by those who believe that. These necklaces were worn by many surfers in the 1960s and 1970s. Some believe they are useful for survival instincts, and may help in dangerous situations. Many ancient cultures believed sharks were Gods or deities, including ancient Hawaiians, who believed that deceased loved ones could turn into a shark and would guide fish to their nets or fishing grounds. They also believed in shark deities, who fulfilled a range of roles in their culture.